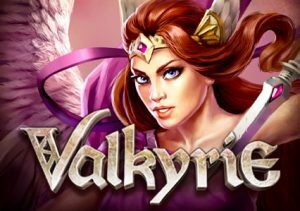 Classy design and explosive features come together very nicely in Valkyrie, a Norse-themed video slot from ELK Studios. Played using a 5 reel, 1,024 ways to win game engine, this Scandi saga comes with special Bonus Spin extras that can award added wilds, wild reels or colossal symbols. There’s also a free spins round where the Bonus Spin extras can come into play. Stakes on all devices range from between 20p and £100 per spin. Video slots from ELK Studios have a definite ‘look’ and that’s certainly true of Valkyrie. The visuals are done comic book style are excellent. As is the stirring, orchestral backing track. On the reels you’ll see an assortment of royal values, gold jewels and a quartet of higher paying Valkyries. Land 3, 4 or 5 of the best of the Valkyries and you’ll win an award equal to 2, 4 or 8 times your total bet. Look out too for the golden shield which is the game’s wild. Shield of Chance feature – After Freya summons up the spirit of Odin with her shield, a volley of wilds will shoot down onto the reels. A new payout is then made with the wilds in position. Sword of Destiny feature – look out here for Freya’s magic sword which floats above the middle 3 reels. If the sword drops, the whole of that reel turns wild. A new payout follows. It’s possible to turn multiple reels wild here. Arrow of Fortune feature – Freya shoots 3 arrows into the sky. As they drop, they turn into 2×2, 2×3 or 3×3 symbols blocks. A payout is then made with the colossal symbols in play. Land 3, 4 or 5 of the scatter and you’ll trigger the main bonus round, the Valhalla Free Spins feature. On offer here are 5, 7 or 10 free spins. The Bonus Spin extras can hit here too. With 5, 7 or 10 free spins, you’ll receive 1, 2 or 3 Bonus spins. This means you can benefit from extra wilds, wild reels and colossal symbols on each free spin. Finally, you can retrigger the feature infinitely. If you like volatile action, then Valkyrie should appeal as this is a high variance game. The Bonus Spin extras, when combined with the Valhalla Free Spins feature have the potential to deliver some pretty explosive action – to the tune of 5,000 times your bet on every free spin! As well designed as you’d hope for an ELK Studios video slot, Valkyrie is an entertaining all-rounder. The Norse epic is an increasingly popular theme. If you’re after an especially fiery take, then Valkyrie is a pretty good place to start. I would also highly recommend NetEnt’s Vikings which is based on the iconic television series.